And if I am missing anything, feel free to comment below! So, let's go in order shall we? Plot: After a series of films, Jack Horner is now the most popular Fable currently in existence. Unfortunately for him, in order to keep him in check and preserve the safety of the other Fables, Fabletown authorities strip him of his fame and money. To make matters worse, while trying to hitch a ride, he is kidnapped and brought to the mysterious Golden Boughs Retirement Village, a heavily guarded settlement in the middle of nowhere that just so happens completely populated with Fables. Where exactly has he found himself? How Familiar Do You Need to Be With Fables? This book does make efforts to explain the Fables Universe, but they are short and often feel rushed so as not to interfere with the momentum of the story. Really, the exposition feels more like a reminder rather than an introduction. My advice? It will probably be more satisfying to be familiar with Fables first and branch out at the same time this story removes itself from the main book after the Jack Be Nimble story-arc (Issues #34-35). 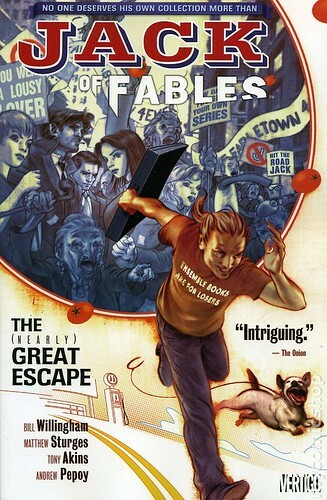 Down the line, there is a crossover story-line/event back with the original Fables series, so if you want to read both stories together, I'd imagine that would be best and probably what the powers that be had in mind. I would also like to put out there that having read Fables helps give the story more impact when Jack runs into previously established characters. It's better to be all "Hell yeah, Bigby!!" than "Oh, so this is that Bigby guy..." Well at least it was for me. Yes, But Is the Story Any Good? Jack of Fables is quite a good story on its own. New types of characters are introduced with the Literals (literary elements and devices manifest themselves as more than just story characters) and its great to see the Universe expand to include American Folktale characters. Like any series of length it does have its hills and valleys, so i eventually found myself switching from issues to trades to move forward a bit more comprehensively. Also, the artwork is good, but nothing I would call all that memorable. 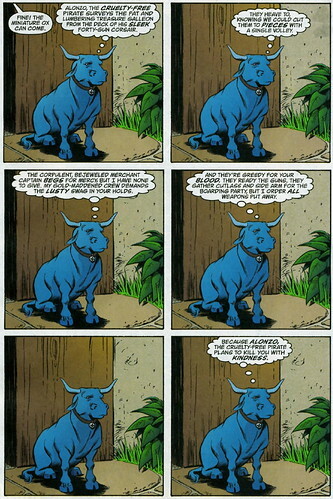 What Jack of Fables has that is different than Fables itself is the sense of humor. This series seems to revel in its own wackiness. Jack narrates the story himself and is not afraid to break the Fourth Wall. I have found myself often wondering how long they can keep all this up before Jack stops being funny and starts getting annoying, but since I still need to finish the series myself, I am assuming that I will have the opportunity to find that out as I keep going. Jack remains quite himself as always: selfish, careless, and as much of a pig as ever. That being said, a character that doesn't grow can lose my interest in the end. So let's hope that Jack begins to learn a little something in the end. Then again, there is something to be said for a character who is such a jerk that the more interesting story is what happens to those who are merely caught in his wake. Bonus Element: Babe the Blue Ox. Though Babe gets shrunken down to a more manageable size, the same can't be said about the little ox's vivid imagination. Verdict: I find myself stopping and starting a lot with this series. One minute I am reading three trades in an afternoon, the next I was putting it down for a few months. Part of this was waiting for the trades to come out way back when, but they are certainly all available now, and I still haven't managed to finish the entire series. I am getting close, though, and I certainly plan to finish. Besides, rumor round the web says that the ending is rather big. I think that part of the problem with the series for me is that this series focuses more on American Fables and Tall-tales. While this is VERY cool at times, a lot of these stories and characters are not as familiar to me as the ones in the first Fables series. There are plenty of more well-known characters to even things out, but I did find myself grabbing my phone to look up characters like Natty Bumppo and Slue-foot Sue. And yes, I love getting lost in Wikipedia reading about all these different characters and stories, but it does slow down the reading. And then I run the risk of getting distracted by something else. Ok, after all that, let's pretend I have to give you a simple yes or no answer. My answer is yes, because there is a lot of fun to be had, even if you don't stick it through to the end. Oh, and also...Babe. Additional Reading: I am merely putting this in here because I feel that this is a pretty great interview with Bill Willingham where he directly talks about the spin-offs and how they fit into his vision of a Fables universe. You can read the interview on the Nerdist Website at this link. Stories spin-off, grow, and change hands. They always have, so why not revel in it?